Francine Russo. They're Your Parents, Too! How Siblings Can Survive Their Parents' Aging Without Driving Each Other Crazy. Bantam Books. New York, NY. 2010. 286 pages. Sibling relationships can be difficult even in the best of times, but add in an aging parent and there is bound to be some tension. They're Your Parents, Too! offers insight and strategies to help siblings work together when established family roles are upended. Written by Francine Russo, a journalist who covers the baby boomer beat, They're Your Parents, Too! provides guidance on transitioning from a family relationship in which the parents are in charge to one in which the children are in charge. Russo explains how siblings may differ in how they handle situations, and the ways parents can create confusion among siblings. Using compelling interviews with real families, Russo explores various family dynamics and how they can affect a parent's care. 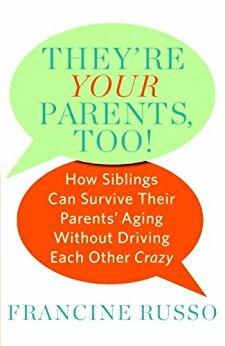 Stressing that it is important to learn to accept a sibling for who they are, Russo offers strategies for working together with siblings, taming sibling rivalries, and coping with a parent's dementia. Sibling conflicts don't necessarily end when a parent dies, so Russo also discusses the different ways siblings may mourn and how to deal with inheritance issues. They're Your Parents, Too! is a compassionate and interesting book that can help siblings understand each other better, enabling them to better collaborate on parent care and sustain a family connection.